Manufactured with thick walls, Geotech Geobailers are more biodegradable and heavier than standard disposable bailers, and sink every time. You usually have to pay extra for a heavier bailer, making Geotech bailers a much better value. ﻿More biodegradable: All Geobailers are more biodegradable than traditional plastics. A special additive breaks the plastic down more quickly. The additive causes the plastic to be an attractive food source to certain soil microbes, encouraging the plastic to be quickly consumed after it has been discarded. 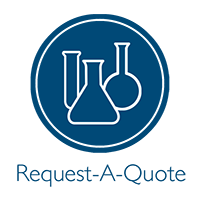 Laboratory certified: Geobailers are NELAC laboratory lot test certified to be free of contaminants and suitable for environmental sampling and bailing applications. Manufactured under strict clean conditions:Made of virgin, FDA approved, high-density poly resin. The polyethylene used contains no plasticizers or additives. No regrinds are accepted. Improved bailer design: Geotech's "Orbit Flux" design fills 33% faster than other bailers. V-notch feature for trouble-free cord attachment, and accurate pouring. Weighted disposable bailer: As heavy as most double-weighted without the extra cost. Optional double check valve: Isolates the sample, sealing as the bailer is removed from the well at specific depths. 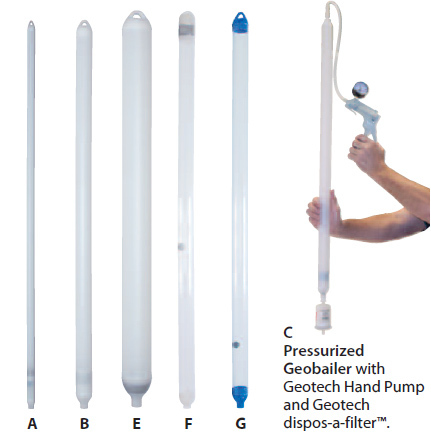 Pressurized Disposable Bailer: This Disposable Geobailer provides the convenience of using in-line dispos-a-filters™ in the field even when pumps are not available. By using a pneumatic hand pump you can filter your samples directly from the bailer, saving time while maintaining sample integrity.